I’m back now from attending Linuxtag 2009 in Berlin. On Saturday I gave a presentation about openSUSE 11.2 and we had some good discussions about it. I demoed WebYaST which will be an exciting addition to openSUSE. WebYaST allows remote – and also local – administration of your system. The participants of the talk mentioned also that “zypper dup” to update from 11.1 to 11.2 is an important addition. Btw. to learn more about openSUSE 11.2, check this wiki page which is regularly updated. Adrian took some photos and uploaded them to the gallery. It was great to see the momentum behind the education project, I talked a bit with Jan (and listened to his excellent talk) and Lars about it. The task for this week was to add support to the frontend so that desktop clients like osc can add the oauth specific parameters to the http “Authorization” header. The ruby library was already able to handle this and therefore I only needed to do a very small change in our urllib2 OAuthHandler which is used by osc. – the current flow looks like the following: a client makes an unauthorized API request, the API sends back a 401 to tell the client that it needs to authenticate. Therefore the response also contains the following http header: ‘WWW-Authenticate: basic realm=”Frontend login” ‘. This indicates that the client should use basic auth to authenticate with the API. The question is how we can tell the client that it could also use oauth? Sending back something like ‘WWW-Authenticate: basic, oauth realm=”Frontend login”‘ will probably break some clients. Fortunately darix had a great idea: the client simply tells the server which auth methods it supports. This can be done by adding a new http header like ‘Accept-Authentication: OpenID; OAuth;q=0.8, digest;q=0.7, Basic;q=0.5″ ‘ to each request (q indicates which method is preferred, see other http headers like ‘Accept-Language’ for the details). If the API needs authorization it looks at this header and picks the “preferred” method from this list and sends back ‘WWW-Authenticate: <preferred_and_supported_method>, realm=”Frontend login”‘ ‘. In case the Accept-Authentication header is omitted the application’s default method is used (in our case basic auth). Another thing which needs to be discussed is how the API should behave if the client only accepts methods which aren’t supported by the API (e.g. should the API send back a 401 or 406?). Apart from thinking about this the other task for this week(end) is to add an UI for managing oauth tokens etc. The first part of this task is to decide which tasks the UI should support (like revoking tokens, authorize tokens etc.). The next meeting will be on monday to discuss the first results. If you’re in Berlin or nearby, be sure to visit LinuxTag this week! LinuxTag runs through Saturday, June 27th. Don’t forget, Saturday is openSUSE Day at LinuxTag! We have great talks in store for everybody at LinuxTag, including presentations on LTSP in openSUSE, Wine on openSUSE, AppArmor, and what’s new in openSUSE 11.2. While “selling” openSUSE to a friend of mine, I tried to explain him all the steps of the installation and all the configuration options which I had changed. He was not any geek and it was his first time seeing Linux. While most of the installation did not need much explanations, I definitely spent most of the time on partitioning. Not that initial proposal was not fine, unless one has special requirements, but there is one elementar input, which even newbies may want to set: How to split disk between Windows and Linux. The installation proposal works just fine, but if one needs to keep more or less space for Windows than proposed and does not have any skills, he is doomed – and so would have been he. Now attacker will just have three attempts to break in. Thanks to Raul Libório from the openSUSE Marketing Team, you can trick out your Twitter background with your openSUSE Project affiliation (member, ambassador, user). 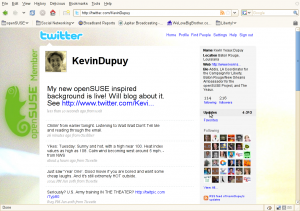 Check out the openSUSE Social Network marketing page to get yours (look under “Sidebars for Twitter”. Posted in Marketing | Comments Off on SUSE Out Your Tweets! I’m back now for some days from my two months of parental leave and decided to get reacquainted with the openSUSE Build Service and the osc command line client. I’ve checked which packages are failing in Factory on x86-64 (via this link) and checked the log files for some low hanging fruits that I could easily fix.